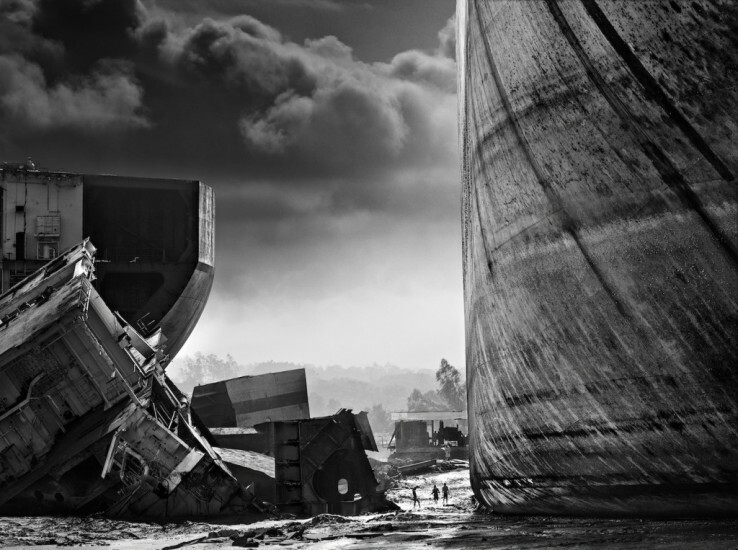 The ship breaking yards of Chittagong, Bangladesh offer a mystical allure that is incongruous. There maybe romance in the art of building big ships – my family background in fact – but there is little for the romanticist in the primitive dismantling of these vast cathedrals in the sky on these muddy shores to the north of the country’s second city. This is a nasty, dark and soulless place – ostensibly it offers nothing but an elemental canvas on which to frame extremes. However the haunting rawness of the factory beaches is spectacular – there is so much more for artists to feast on here than at the beaches of St Tropez. This is emphatically life on the edge of our planet and its depiction offers a good opportunity to propose that beautiful art is not exclusive to the portrayal of aesthetically beautiful things. That linear a relationship would make all our lives one dimensional and uninteresting. Very few western photographers make the trip to this part of the world and the corollary of this is the chance to engage and maybe even shock with the results of the assignment.